Panelists Susan Page, Elisabeth Bumiller and Julie Pace react to each other’s commentary during a Medill event Tuesday. About 250 people filled the MFC auditorium and lobby overflow seating. 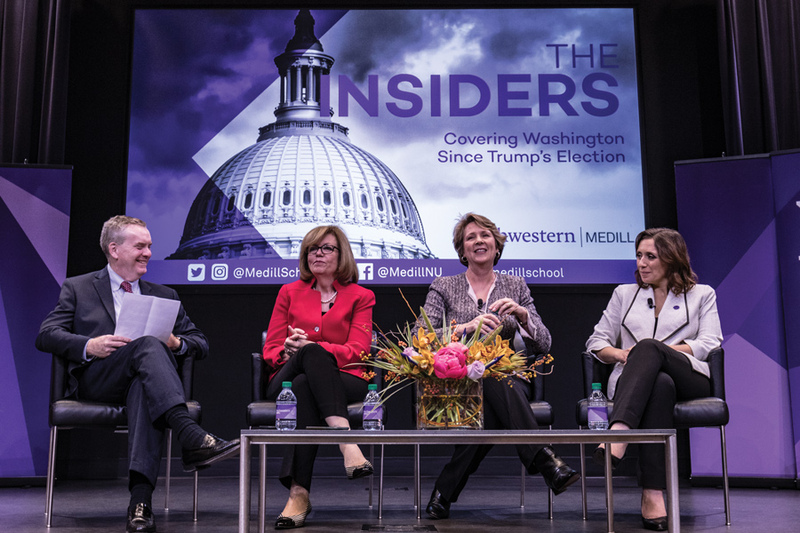 Three Medill alumnae and Washington bureau chiefs discussed the realities and misconceptions of journalism one year after President Donald Trump’s election during a Tuesday panel. About 250 people gathered at the McCormick Foundation Center Forum for the event, hosted by the Medill School of Journalism, Media, Integrated Marketing Communications. Panelists included Elisabeth Bumiller (Medill ’77) of The New York Times, Julie Pace (Medill ’04) of The Associated Press and Susan Page (Medill ’73) of USA Today. All three oversee Washington news coverage for their respective publications. The panelists discussed how they covered inaccurate statements made by Trump. They said most news bureaus avoid the word “lie” in their stories because reporters are unable to prove the motive of untrue statements. Despite what readers may think, Pace said the issue of labeling inaccuracies is complex, and her responsibility is only to identify them, not comment on them. Pace said she disagrees with critics who claim media coverage had a negative impact on election results. She said AP coverage, which many local news outlets feature, focused equally on Democratic nominee Hillary Clinton and Trump. Therefore, she said, it was up to readers to absorb all the news. Jah Jean-Leger (Weinberg ’17), who attended the event, told The Daily she was glad she could relate to the event’s topics because she majored in political science. She added that it can be “alienating” for average readers to interpret articles and fact-check for themselves. She said those who do not have a background in political science or journalism can easily be intimidated by “dense, polarizing” coverage. Tim Franklin, Medill’s senior associate dean, moderated the event and told The Daily that news outlets aren’t usually transparent about how they choose stories or report on events. He said he wanted to learn if reporters and news organizations had evaluated their successes and mistakes from the past year. Bumiller said being attacked by the White House for being “enemies” of the administration was “laughable.” Media outlets usually have low approval ratings because journalists often report on unpopular events, Bumiller said. Page, who has covered 10 presidential campaigns, said journalists consistently need to be “smarter” in their coverage of each election.